Rackspace Cloud Files is a CDN which runs on Akamai’s Infrastructure with OpenStack Swift. It is cost effective solution to Serve HTML Files. 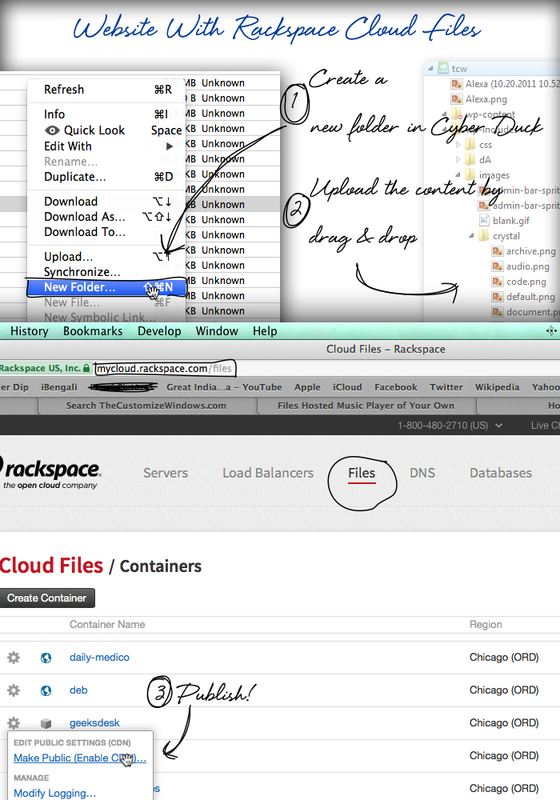 Previously, to convert a Container on Rackspace Cloud Files to Server HTML Pages, we needed a bit tweaking. Now, Rackspace Cloud Files control panel provides the option to directly create a static HTML website. We have good amount of tutorials on Rackspace Cloud Files, like a recently published article on how to Manage Rackspace Cloud Files with Swiftly CLI Tool. It worth to read this previous guide in this context – Website With Rackspace Cloud Files : Hosting That Costs Cents. Practically, we server HTML Pages with a PHP and MySQL backend. Not all the websites we own are regularly updated, a CDN with HTML files can not be hacked, but a WordPress instance which is not cared can get hacked. There are WordPress Plugins to generate pure HTML Pages out of WordPress all Pages. Your Domain Register must have a system to add CNAME to main domain in order to point towards a container or you can use a Third Party Tool like Hover.com. Rackspace Cloud Files To Serve WordPress WebPages : Kind of Manual Meteor ! Rackspace themselves use Rackspace Cloud Files to host their developer blog. They use OctoPress for their blog. This subdomain of this website is also hosted on Cloud Files. Yes, you will need to plan a bit to properly upload the generated HTML pages, that is actually possibly to rightly get rendered if you upload all the static contents of wp-content, wp-includes folder. Not only using Rackspace Cloud Files to serve WordPress WebPages saves money, but also it actually decreases the issues with maintenance of a full Apache2 web server. You will have to use some Text Editor to search and replace the localhost to your domain name as probably you will use localhost to generate the webpages. This Article Has Been Shared 4087 Times! Free Cloud Backup is becoming a popular method to save data. Amazon Cloud Drive offers free Cloud Storage. Here is how to use Online Backup service of Amazon. Cite this article as: Abhishek Ghosh, "How To Use Rackspace Cloud Files To Serve WordPress WebPages," in The Customize Windows, March 31, 2014, April 25, 2019, https://thecustomizewindows.com/2014/03/how-to-use-rackspace-cloud-files-to-serve-wordpress-webpages/.